Office 2010 has a few great new features and improvements which make sharing and collaboration easier than ever. 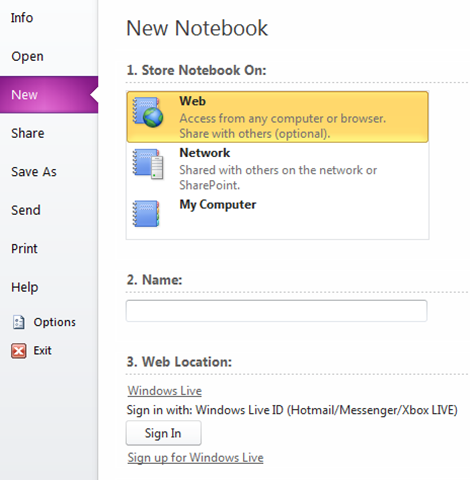 You can now create OneNote notebooks through web browsers and have other people to view, edit and collaborate anywhere. All notebooks created online will be saved to SkyDrive so you will need to have a Windows Live ID. OneNote Web Application is free, just like other similar live service Microsoft has delivered over many years (hotmail, messenger). To get start with OneNote Web App, go to http://office.live.com and logon with your Windows Live ID. 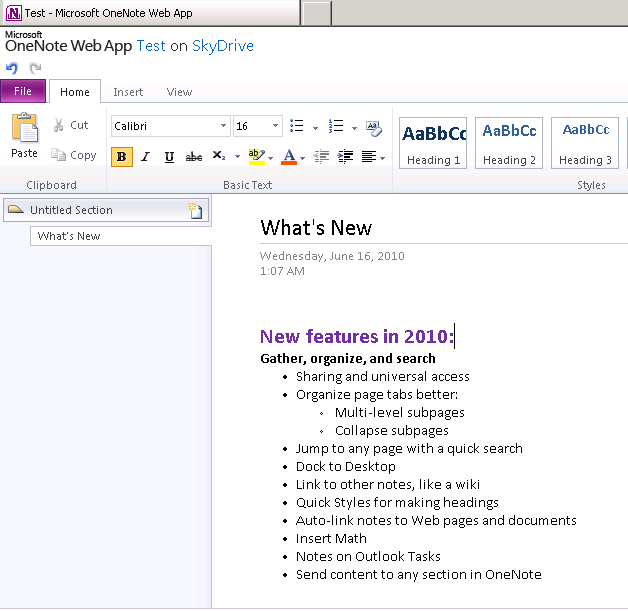 OneNote Web Application has familiar OneNote interface so you don’t have to learn it. (This feature is only available in OneNote 2010 RTM) When you creating new notebooks, you can save them to SkyDrive so they are available to you everywhere. You will need to upgrade notebook files to OneNote 2010 file format as only 2010 format is supported by SkyDrive. There are many enhancement in OneNote 2010 that improves collaboration. Green highlighting unread changes. The pages contain unread content will have bold text in tab and all unread content will be highlighted in green. Author highlighting. Author name will be highlighted right to the content. Recent Edits highlights what changed recently and what is new in yellow. The group SMS could be handy to have, but the SkyDrive and Office 365 integration is going to make my life so much easeir. I found it odd that WP7 didn’t have full integration with those services from the beginning. Using Office on the go is really hindered without access to the files you want (assuming you do not sync everything into the limited space on the phone). Storing them on SkyDrive is the logical answer, integrating it simply completes that.